Aspiring airline captain Madeline Starr found her flight plan at MGA. Full Name: Madeline S. Starr. High School: "I attended Woodland High School in Stockbridge. I participated in concert band, steel band, women’s basketball and the environmental club." Family: "My parents, Harvey and Madeline J. Starr, and other family members always believe in me and encourage me to be the best that I can." Employment: "I am a full time student taking classes year round." Degree Objective: "I am working toward a bachelor's degree in Aviation Science and Management with a concentration in Fixed Wing Flight. Along with the degree I am working on obtaining all of my flight ratings needed to fly for the airlines." Activities: "I am a member of CAB (Campus Activity Board), WAI (Women in Aviation) and the treasurer of the Eastman chapter of OBAP (Organization of Black Aerospace Professionals)." Career Goals: "I want to become a captain for a major airline." 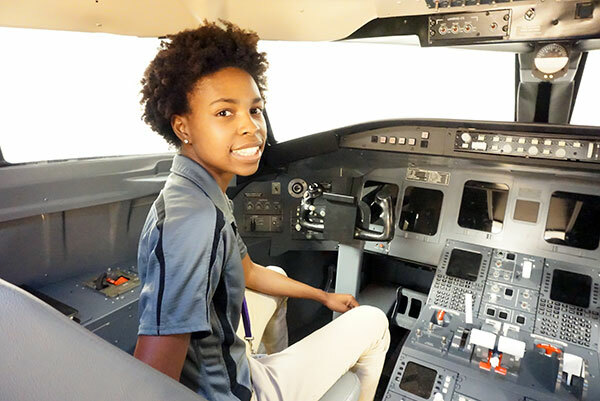 She chose Middle Georgia State University because … "MGA offered all of my classes and flight training close to home." The greatest thing she discovered about Middle Georgia State was … "The professors! All of them are so willing to help you." Her greatest academic experience so far as a Middle Georgia State student has been ... "I'm proud I've done well academically and can help my classmates." To her, “greatness” means … "Having goals and taking the steps needed to reach those goals." One thing people don’t know about her is … "I grew up drag racing and go to the race track with my family almost every weekend because my dad continues to race." In five years ... "I see myself working at a regional airline where I can build up experience in order to move on to the major airlines. Also, I'd like to do some traveling and see the world."